Ritwik Ghatak (4 November 1925 - 6 February 1976) was a Bengali Indian filmmaker and script writer. Ghatak's stature among Bengali film directors is comparable to that of Satyajit Ray and Mrinal Sen.
Ghatak entered the film industry with Nemai Ghosh's Chinnamul (1950) as actor and assistant director. Chinnamul was followed two years later by Ghatak's first completed film Nagarik (1952), both major break-throughs for the Indian cinema. Ghatak's early work sought theatrical and literary precedent in bringing together a documentary realism, a remarkable stylized performance often drawn from the folk theatre, and a Brechtian use of the filmic apparatus. Ghatak's first commercial release was Ajantrik (1958), a comedy-drama film with science fiction themes. It was one of the earliest films to portray an inanimate object, in this case an automobile, as a character in the story. 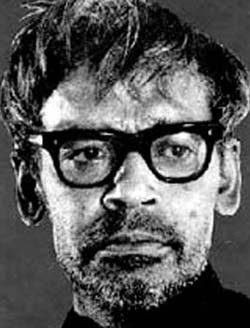 Ritwik Ghatak directed eight full-length films. His best-known films, Meghe Dhaka Tara (The Cloud-Capped Star) (1960), Komal Gandhar (E-Flat) (1961), and Subarnarekha (1962), a trilogy based in Calcutta and addressing the condition of refugee-hood, proved controversial and the commercial failure of Komal Gandhar (E-Flat) and Subarnarekha prevented him from making features through the remainder of the 1960s. In all three films, he used a basic and at times starkly realistic storyline, upon which he inscribed a range of mythic references,especially of the Mother Deliverer, through a dense overlay of visual and aural registers. Ghatak moved briefly to Pune in 1966, where he taught at the Film and Television Institute of India (FTII). During his year at FTII, he was involved in the making of two student films, viz., Fear and Rendezvous. Ghatak returned to film making only in the 1970s, when a Bangladeshi producer financed the 1973 epic Titash Ekti Nadir Naam (A River Called Titas). Making films became difficult for his poor health, due to extreme alcoholism and consequent diseases. His last film, and perhaps his most innovative, was the 'autobiographical' Jukti Takka ar Gappo (Reason, Debate And Story) (1974).He had a number of incomplete feature and short films in his credit. He belonged to an illustrious family. His father Suresh Chandra Ghatak was a district magistrate and also a poet and playwright, mother's name was Indubala Devi. He was their 11th and youngest child. His elder brother Manish Ghatak was an acclaimed radical writer of his time, a professor of English and a social activist who was deeply involved with IPTA theatre movement in its heyday and later on headed the famous Tebhaga Andolan of North Bengal. Manish Ghatak's daughter is the legendary writer and activist Mahasweta Devi. Ritwik's wife Surama was a school teacher and his son Ritaban is a film-maker. At the time of his death (February 1976), Ghatak's primary impact would seem to have been through former students. Though his stint teaching film at FTII was brief, one-time students Mani Kaul, John Abraham, and especially Kumar Shahani (among many others), carried Ghatak's ideas and theories, which were further elaborated upon in his book Cinema And I, into the mainstream of Indian art film. Other students of his at the FTII included the acclaimed filmmakers Saeed Akhtar Mirza and Adoor Gopalakrishnan. Ghatak stood entirely outside the world of Indian commercial film. None of the elements of the commercial cinema (singing and dancing, melodrama, stars, glitz) featured in his work. He was watched by students and intelligentsia, not by the masses. His students have also tended to work in the art cinema or independent cinema tradition. Satyajit Ray, commonly held to be the greatest of the Bengali neo-realist directors, succeeded in creating an audience outside India during his lifetime and winning many prestigious international awards. Ghatak was not so fortunate. While he was alive, his films were appreciated primarily within India. Satyajit Ray did what he could to promote his colleague, but Ray's generous praise did not translate into international fame for Ghatak. For example, Ghatak's Nagarik (1952) was perhaps the earliest example of a Bengali art film, preceding Ray's Pather Panchali by three years, but was never released until after his death in 1977. His first commercial release Ajantrik (1958) was also one of the earliest films to portray an inanimate object, in this case an automobile, as a character in the story, many years before the Herbie films. Ghatak's Bari Theke Paliye (1958) had no similarity to François Truffaut's later film The 400 Blows (1959), Ghatak's film remained obscure while Truffaut's film went on to become one of the most famous films of the French New Wave. One of Ghatak's final films, A River Named Titas (1973), is one of the earliest films to be told in a hyperlink format, featuring multiple characters in a collection of interconnected stories, predating Robert Altman's Nashville (1975) by two years. Ghatak's only major commercial success was Madhumati (1958), a Hindi film which he wrote the screenplay for. The film was one of the earliest to deal with the theme of reincarnation and is believed to have been the source of inspiration for many later works dealing with the theme of reincarnation in Indian cinema, Indian television, and perhaps world cinema. It may have been the source of inspiration for the American film The Reincarnation of Peter Proud (1975) and the Hindi film Karz (1980), both of which dealt with reincarnation and have been influential in their respective cultures. Karz in particular was remade several times: as the Kannada film Yuga Purusha (1989), the Tamil film Enakkul Oruvan (1984), and more recently the Bollywood film Karzzzz (2008). Karz and The Reincarnation of Peter Proud may have also inspired the American film Chances Are (1989). The most recent film to be directly inspired by Madhumati is the hit Bollywood film Om Shanti Om (2007), which led to the late Bimal Roy's daughter Rinki Bhattacharya accusing the film of plagiarism and threatening legal action against its producers. Ghatak's work as a director also had an impact on many later Indian filmmakers, including those from the Bengali film industry and elsewhere. For example, Mira Nair has cited Ghatak as well as Ray as the reasons she became a filmmaker. Ghatak's impact as a director began to spread beyond India much later; beginning in the 1990s, a project to restore Ghatak's films was undertaken, and international exhibitions (and subsequent DVD releases) have belatedly generated an increasingly global audience. In a critics' poll of all-time greatest films conducted by the Asian film magazine Cinemaya in 1998, Subarnarekha was ranked at #11 on the list. In the 2002 Sight & Sound critics' and directors' poll for all-time greatest films, Meghe Dhaka Tara was ranked at #231 and Komal Gandhar at #346 on the list. In 2007, A River Named Titas topped the list of 10 best Bangladeshi films, as chosen in the audience and critics' polls conducted by the British Film Institute.